Are you tired of spending so much money on food? Does it take away from other things you might want to do to treat yourself like a getting a new outfit or a haircut? 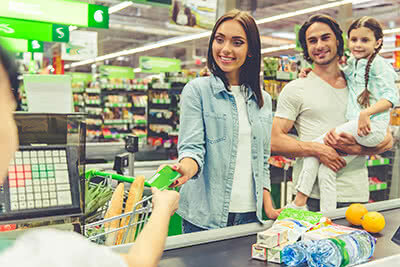 Check out these 5 tips to save money at the grocery store. You'd be surprised by how much money you'll have left in your pocket after shopping! Before heading to the grocery store, check your fridge and freezer for any items you may still have. Doing this will keep you from buying the same item over again. Plus, you can buy something to pair with it and make a meal out of it. For example, you may have a pack of ground beef in your freezer. Instead of buying more meat, you can get an item to go with it like tortillas for tacos or mixed vegetables for a nice pot of soup. If you go grocery shopping without thinking about what meals you're going to have, you'll be running all over the place, not knowing what to buy. As a result, you'll end improvising and throwing things in the cart without a well-thought-out plan. Planning out your meals is a more cost-effective way to shop as you'll have more time to think about prices and ways to save. You can also center your meals around different sales to save even more money. Speaking of prices, you should add them up as you shop using a calculator. Whether you're using a regular calculator or one that's on your smartphone, you'll get a better idea about how much you'll spend before even making it to checkout. This way, you can put items back if you sense you're about to go over your budget. Doing this will not only save money, but it will also save time and even embarrassment at the checkout line. Sometimes off-brand products taste just as good as the big-name brands. You'll save some good money by investing in little-known brands. For example, Walmart offers Great Value as an alternative to big brands. Large grocery stores like Kroger and Publix offer their own brands as well. The best foods to buy off-brand include cereal, canned goods, and even sodas. Earn cash back rewards with Ibotta. Users of this app have earned over $500 million in savings. Before going grocery shopping, you can check the app for special offers (i.e. $3 off, buy one get one free, etc.) on certain products. To prove that you've made the purchase, all you have to do is upload the receipt by taking a picture of it with your phone. Once you've collected a good number of rewards, you can earn up to hundreds of dollars per month if you use the app consistently. Ibotta is not just restricted to grocery shopping either. You can earn cash back on purchases at 750,000 locations including retail stores, department stores, and even online merchants like eBay.